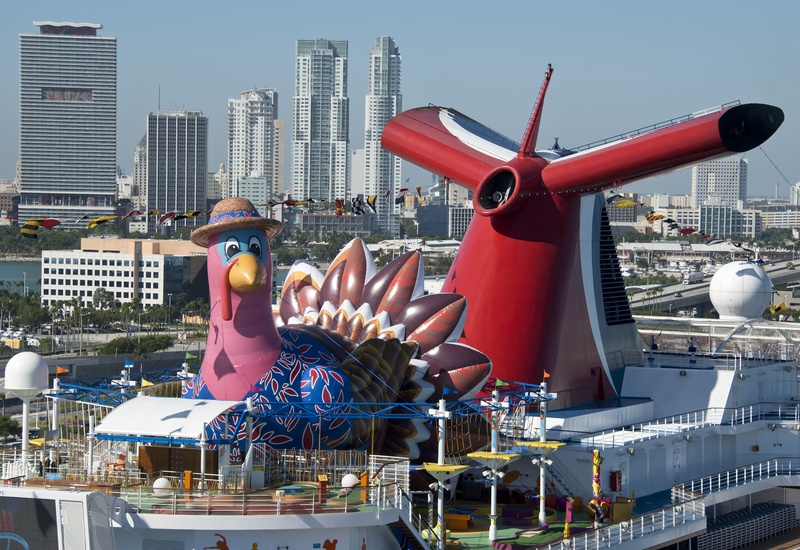 To celebrate Thanksgiving and the arrival of its newest cruise ship, Carnival Breeze, to Miami, Carnival Cruise Lines is donating 137,500 meals to Feeding South Florida and erecting a 50-foot-tall inflatable turkey atop the ship. The 1,250-pound nylon turkey — wearing a straw beach hat and colorful Hawaiian shirt — is scheduled to be displayed on Wednesday, Nov. 21, in time for holiday festivities. The giant fowl will sit 14 stories above the waterline and gaze toward nearby McArthur Causeway until just before the ship makes its inaugural sailing from Miami on Thanksgiving Day. Also on Wednesday, Carnival will present a charitable donation to Feeding South Florida that will provide 137,500 meals to families in need throughout Miami-Dade, Broward, Palm Beach and Monroe counties. Pembroke Pines–based Feeding South Florida is the largest food bank in the state and a member of Feeding America, the nation’s leading domestic hunger-relief charity. In 2011, Feeding South Florida distributed more than 30 million pounds of food valued at almost $50 million within the South Florida community. As part of its Thanksgiving celebration, the cruise line also is mounting a social media contest to give the giant turkey a moniker. The “Name the Giant Turkey Twitter Contest” will run from Nov. 21-25. To participate, contestants use the hashtag #TurkeyOnDeck. Carnival will pick the top three names on Monday, Nov. 26, with the winner announced later that day. The prize is a $500 gift card to fund the winner’s next holiday party. The new 3,690-passenger Carnival Breeze — the largest Carnival ship ever homeported in South Florida — arrives at PortMiami Wednesday, Nov. 21. The ship, which debuted this summer in Europe, brings on-board innovations including a variety of new dining, bar and entertainment options that are part of the company’s groundbreaking $500 million fleetwide Fun Ship 2.0 product-enhancement program. Following a two-day introductory cruise that departs Thanksgiving Day, Carnival Breeze will launch year-round six- and eight-day Caribbean cruises from Miami Saturday, Nov. 24.